I got so many compliments on this at the New Year’s Party I decided I should take the time to write thi up and post it separately. This really was an easy cook! Grabbed a plain 12 lb turkey at Publix for .59 cents a lb. Ya like $7 (cheap!) and a bottle of white wine on sale $6 and headed home. The cook was done at 230*, diffused (CI wok), on raised lower grate, using Publix Greenwise lump and 3 chunks of apple wood . It took 13 hours (just over an hour a pound) till the breast reach 165* IT. Add a one hour rest making it 14 hours Keg to table! 1. Brine the turkey for 24 hours. 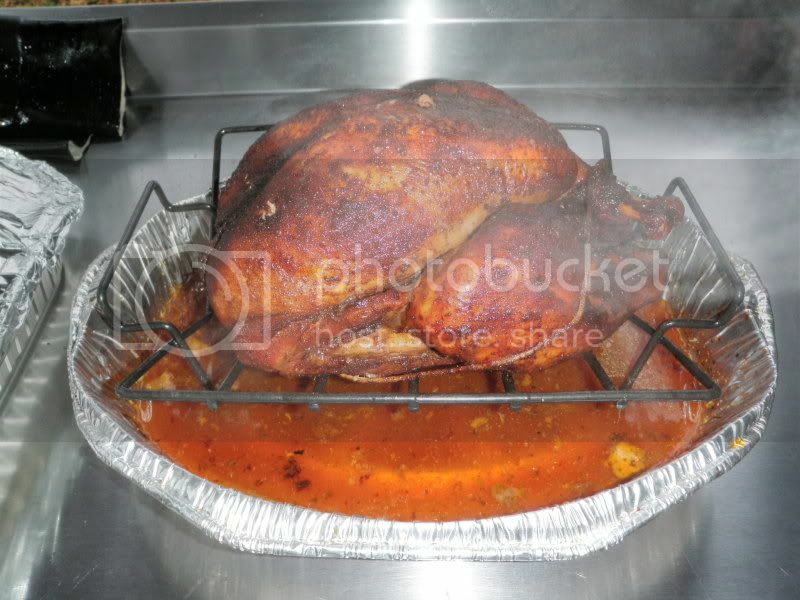 • Place turkey into bucket and add water until the bird is completely submerged. Dump as much ice as you can on top of turkey. 4. OK, put it on the turkey on the Keg, diffused, 230* and add 1/2 a bottle of wine to the drip pan. Nothing to do for the next 6 hours. 5. At 6 hours check fluid level in the drip pan. It should be almost empty. Add the other 1/2 bottle of wine and maybe a little water. Take a one or two hour break. You deserve it! 6. At 8 hours start basting w/pan drippings once an hour. You may notice the temp in the breast is real close to 165* and your thinking “oh no” It’s going to be done to soon! Don’t worry, she’ll go through a stall. The temp will prob even drop back into the upper 150*s.
7. Once the stall breaks and the temp starts climbing back and reaches 161-162* Start basing with the honey glaze. You should get 2-3 coats of this on you bird. 8. At 165* IT in the breast pull the turkey and rest covered for 1 hour. 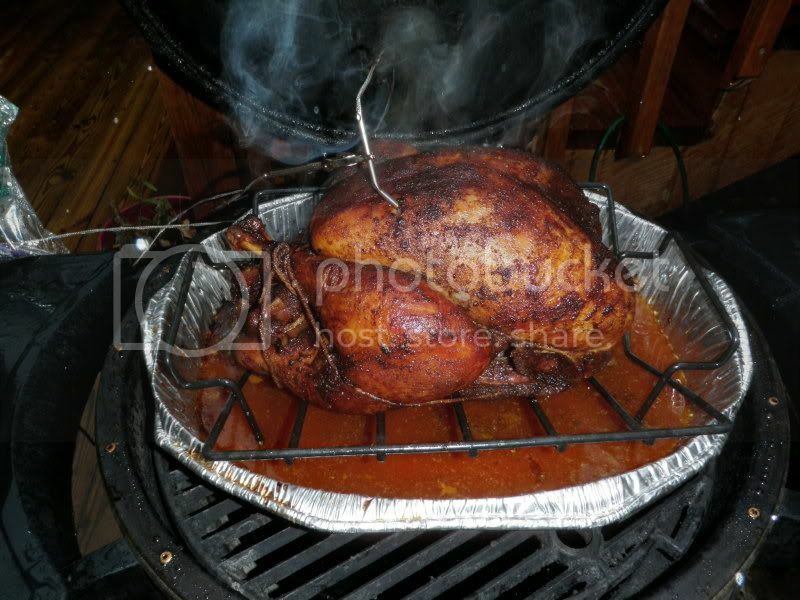 You can make wicked gravy from the pan drippings while that bird is resting too. I de-glazed the pan, made a rue (thanks Cajunator! ), added the strained drippings and it was great! That looks way good, Boat. I'd vote for the Recipe section after an appropriate wait for the positive comments. PS- Boat, you've got an ending bracket missing from your last image URL. The missing bracket is located at the bottom of the previous image. I guess it was just one of them traveling brackets. Outstanding as usual Boat. You are one of the Keg Masters. I vote recipe section on both the process and the results.